Unreal Lawns supply and install artificial grass in Worsley and the north west of England. We serve domestic and commercial customers in the area, with products suitable for a wide range of applications from outdoor spaces and gardens, to event areas, exhibition space and more. See below for some examples of projects we've carried out in the Worsley area. For this older couple in Worsley, artificial grass provided the perfect solution for their front garden. As the couple have been getting older, they were looking to reduce the maintenance and hard work that they were putting into the upkeep of their front garden. After doing some research into artificial grass, they decided this would be the way forward and contacted us here at Unreal Lawns. We talked them through our various grass products, and they settled on the Luxury Grass. It was the longer and fuller style of grass that they prefer, and they couldn’t believe that it was a fake turf when looking at the samples! 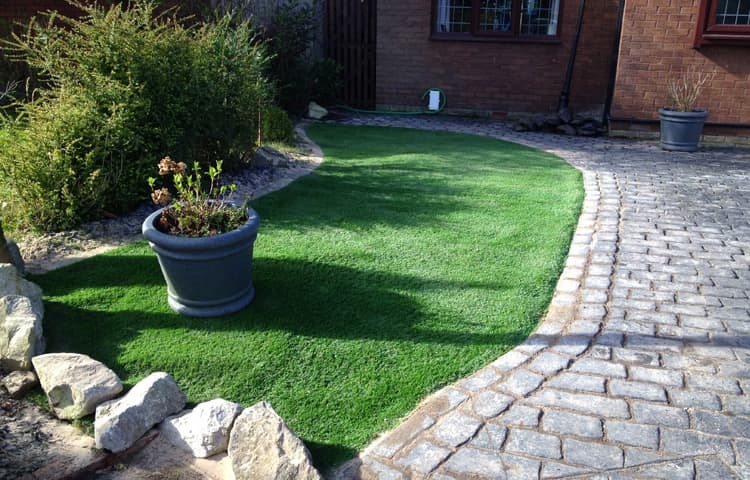 The small area of lawn beside the driveway in their front garden was quick to replace with the artificial grass, and the resulting soft and springy lawn contrasts perfectly with the hard stone. The couple were left delighted with their new lawn. They were particularly pleased knowing their front garden would look immaculate all year round without lifting a finger.